Artist and explorer, Elsa Duault investigates notions of time, space, movement and the metaphysical – working with both paint and the digital space as her mediums of choice. Duault has activated the app, Artivive, where one can scan her work – both the actual artwork and any reprints of it – and be taken to a video of the artist creating in her studio. ART AFRICA sat down with Duault to learn more about her practice. ART AFRICA: You refer to yourself as both an artist and explorer – lending quite a fun and ‘childlike’ notion to the idea of creating art. What is the meaning behind referring to yourself as both an artist and explorer – why not simply an artist? Elsa Duault: I like this notion. Children are like sponges – they immerse themselves completely, discovering and learning, exploring and questioning the established discourses. Seeing myself as an artist and an explorer is both symbolic and literal for me. In 2013, I had to acknowledge and explore my past, and my family’s creative ‘streak’ in order to better understand myself. Furthermore, when I started to paint, I had no ‘formal art education’, so it was a real journey into myself, and art, and art theory, and the entire art world in general. I knew immediately that I was going to spend the rest of my life in ‘creation’. I immersed myself into it completely. Being children of new epochs, I also believe that artists have to immerse themselves into creation and research, to find new ways of transposing and immortalizing their time, their realities. I have many ideas and ambitions, and over time, these will reveal themselves. Explorers project themselves into the future and are fascinated by the unknown, making discoveries and living new experiences. I think artists are the same – the use of the past, the present and intuition allows artists to create new visual realities, ultimately leading the way into the future. Elsa Duault, INSTANT 120-2, 2018. Acrylic on canvas, 120cm Diameter. Image courtesy of Candice Berman Gallery. Your paintings are neither static nor inert – rather, they are the protagonists in a space, commanding and imposing on it, and demonstrating that all ‘becoming’ is based on movement. Why is this notion of importance to you? The idea of ‘becoming’ being based on movement is an idea that can be applied to almost any aspect of life. At both a cellular level and a more visible one, the entire biosphere is in a constant state of movement, presenting adaptation and evolution. As my main sources of inspiration are ‘nature’ and ‘flux’, my process had to consider movement – allowing the paint to move by herself. My paintings therefore become what they are by themselves. Forces present in movement are almost impossible to control entirely, and as Penny Siopis says, “it’s good to let it go”. I stumbled on the idea of the ‘abstract-real concord’ in Kandinsky’s essay, ‘Concerning the spiritual in art and painting in particular’. Here, he speaks of music, but I think it can also be applied to painting. “But when the new ‘realism’ transformed, and by new processes and a point of view that still eludes us, will flourish and yield its fruits, then maybe resonate a concord (abstract-real) that will be a new heavenly revelation. But it will then be a pure crosstalk opposed to the impure mix of the two forms that are currently observed.” (translated from the French version of the essay, Edition Folio Essais). The ‘realism’ in my paintings refer to movements and shocks present in nature, ultimately reproduced and allowed in my process of doing. 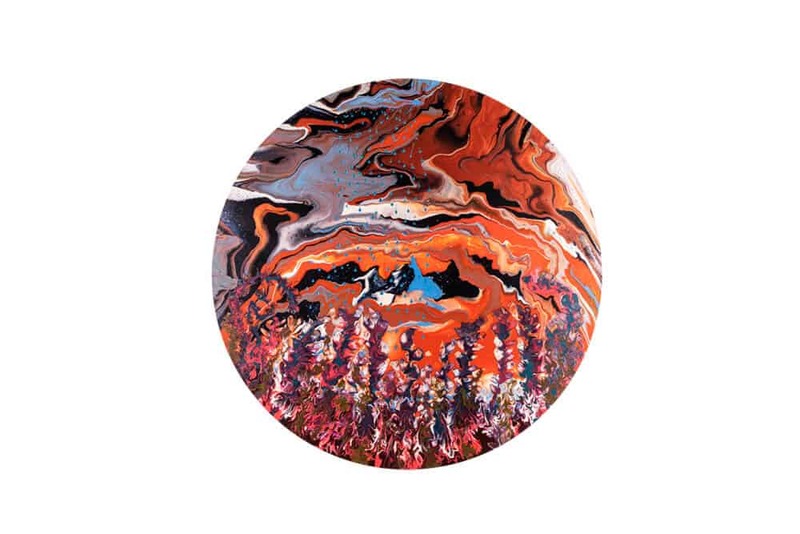 Following on from the previous question – your work is reminiscent of the ancient technique of marbled paper or Ebru. What about this medium appeals to you, and how and why does it best portray your understanding of ‘becoming’? Also being inspired by both the visual and technical aspects of marbled paper, the notion of ‘becoming’ lies again in the process – in the re-questioning and re-interpretation of technique. However, the process and the final result in my work is far removed from the traditional art of Ebru. Elsa Duault, INSTANT 120-4, 2018. 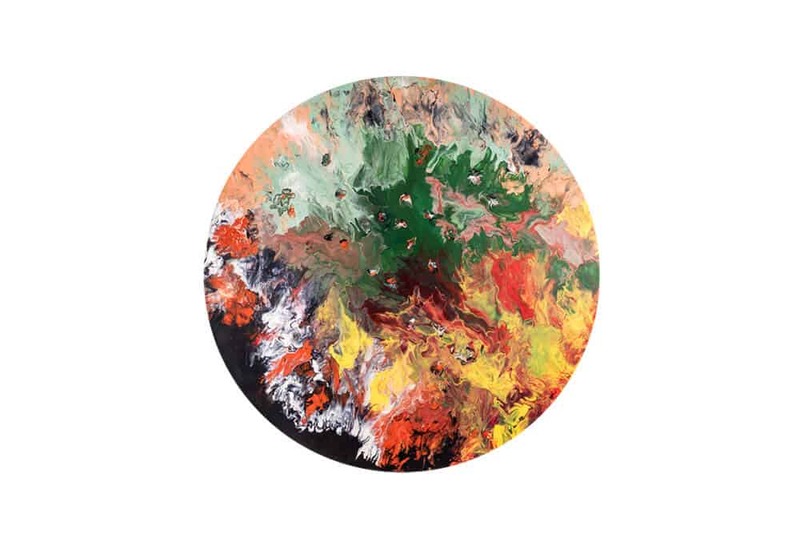 Acrylic on canvas, 120cm Diameter. Image courtesy of Candice Berman Gallery. Furthering your exploration into time, space, movement and the metaphysical – you have made use of the digital application, Artivive. Could you please tell us more about this? How does it work? And why did you choose to work this ‘additional medium’ into your practice? Artivive allows one to experience art in augmented reality – which means adding information to reality. After downloading the Artivive app free of charge on your smartphone or tablet, you can scan the painting via the app. It works with both images of the painting, as well as the actual painting. After scanning the painting, almost instantly a short video will appear on your device – it’s like the artwork is a code that allows the video to play, working in a similar way to a QR code. Each painting in my series, ‘INSTANT-120’ – which is made up of 13 acrylic paintings – have the augmented reality experience. Some of these works will be up on exhibition at the Turbine Art Fair in July. I also used Artivive for another series of work. ‘INSTANTANEOUS’ – made up of six paintings – sees an augmented reality of musicians and a dancer improvising in my studio space while I paint. We were all influencing each other throughout this process, and the painting’s final result. This experience was both video and sound recorded, and will be presented to the public during my solo show, ‘Spectrum of Life’, at Berman Contemporary, from the 26th July until the 16th August. It was a great experience to break the boundaries between different art practices and let the magic unfold in the studio. I chose to use this medium as an additional visual experience for the viewers and to share my process. I also did it to capture the beautiful and fleeting moments created by the paint while I work. I wanted to transcend time and space and capture what the public can’t see – the “behind the scenes” I suppose. I told myself: “they have to see that, so make it happen!”. And I did – I shot all the footage and did all the video editing. I learned a lot! Most of the footage has been accelerated in order to offer more content – the process of blowing is quite slow in real life, which it doesn’t seem like in the videos. In your artist statement, you refer to a quote by Antoine-Laurent de Lavoisier – “in nature nothing is lost, nothing is created, everything is transformed”. Why is this statement of importance to you? This quote is the only thing I can remember about my middle school physics class – it actually made me daydream for a while! But apparently, Lavoisier re-formulated a quote from the Greek philosopher, Anaxagoras (510 – 428 BC): “No thing comes to be or passes away, but is mixed together and dissociated from the things that are.” Even philosophy is a circle that never ends. Today, on both a technical and spiritual level, I could say that in my art, nothing from past artistic discoveries has been lost, and nothing is purely created – because, inspired, I am transforming, changing, and reinventing the use of paint. I am inspired, and I follow my instinct and intuition. Transformations in art and in the history of humanity have always been present and complex. Elsa Duault, INSTANT 120-3, 2018. Acrylic on canvas, 120cm Diameter. Image courtesy of Candice Berman Gallery. Lastly, you come from a background in the advertising industry – what prompted you to leave a career in advertising and rather follow a path in art? In fact, even before finishing my Masters, I knew I wanted to become an artist, it was already inside me. The advertising industry pushes you to “lie” to the public, but the artistic process and career is a constant search for truth. It opened my eyes I guess. I am thankful for the communication side of my studies – it taught me how to create an event from A to Z, manage a team and how to better express my own ideas. It also allowed me to live in Paris for two years, which is the city where everything started for me, at some point. You can download Artivive on there website. In an article on Elsa Duault in the June 2018 issue of ART AFRICA, Artivive was incorrectly referred to. This has since been amended on all our digital platforms. FEATURED IMAGE: Elsa Duault 1992, Inside the Creature, 2017. 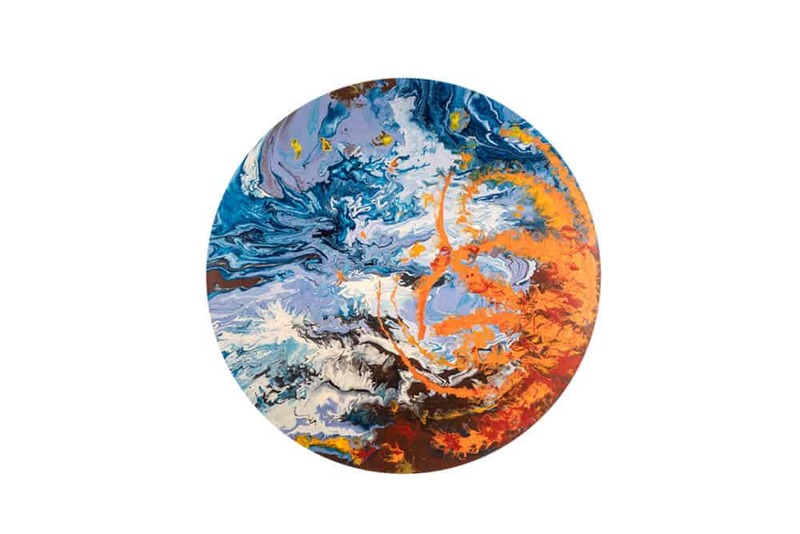 Acrylic on canvas, 120cm Diameter. Image courtesy of Candice Berman Gallery.